National Motorsport Week, an initiative led by the Motor Sports Association (MSA) and the Motorsport Industry Association (MIA), is taking place this week. The main aim of the scheme is to reinforce the importance of the Motorsport industry to the UK’s economy and to promote excitement and interest to a wide range of audiences. 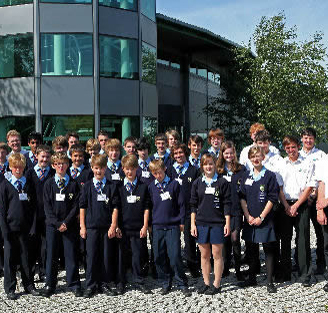 On Monday 27th June 2011 Xtrac Ltd invited two local schools, Kennet School in Thatcham and Trinity School in Newbury, to attend a presentation and a factory tour at Xtrac’s facility in Thatcham. The day was aimed at pupils of 13 – 15 as this is the group believed to benefit most from the experience. They are reaching the stage in their school life where they need to think about choosing which subjects to continue into the upper years of school or are beginning to think about life after school and the career opportunities they have. Xtrac held two sessions throughout the day where 25 pupils from Kennet School attended the morning session and 29 pupils from Trinity School attended the afternoon session. The presentation was conducted by Xtrac’s own under graduates and apprentices in order for the school pupils to have a chance to ask them about the choices they made when they were younger and how and why they ended up in the Motorsport industry. Xtrac’s students and apprentices also gave some background information on the company and the different types of transmissions the company has developed for Formula 1, Sportscars, Touring car and Off Road. Aspects of the engineering, design and manufacturing departments were covered as well as Xtrac’s award winning Advanced Apprenticeship Scheme. After the presentation the pupils were split into 3 groups and taken on a tour of the factory led by one under graduate and one apprentice. The feedback from the pupils afterwards was incredibly positive with all of them saying how interesting the day had been. “We were really surprised to find such an impressive facility right here in Thatcham. We would have expected to find a big factory like this in London.” It was a good way for the students to see the possibilities that are available to them in their local area. The tour began in Xtrac’s drawing office with a brief introduction to the engineering structure before moving on to material stores and the turning and milling departments. There were parts on display for the pupils to pick up and inspect more closely. They then moved on to the gear cutting and bevel cutting areas where some demonstrations were given, which they particularly enjoyed as they were able to see some of the materials and machines used in school being used in real life. A great example of how the event helped to bridge the gap between education and the outside world. The groups then transferred to the grinding and heat treat departments before making their way to inspection, laser etching and finally the build shop where they got to see some finished gearboxes including an F1 box just back from Valencia! “I really enjoyed hearing how something was made from stage one to the finished product. I’m a very hands-on person and loved the factory tour – I can’t imagine being stuck in an office all day! It’s a shame there aren’t more females involved in this industry.” A refreshing perspective from one of a handful of females from the school, which shows how important National Motorsport Week is in showcasing the industry to all audiences. The pupils were engaging throughout the sessions, asked very informed questions and showed some good engineering knowledge. They all stated how helpful the day had been from an educational perspective; they especially liked the design aspect of the tour and seeing how the drawings are developed. Xtrac’s contribution to National Motorsport Week was a resounding success with each pupil taking away valuable learning experiences and a better understanding of the Motorsport industry. Peter Digby, Xtrac’s Managing Director, emphasised the significance of this initiative; “It is especially important today that the workers of tomorrow get to see the value of the manufacturing sector as this will drive the UK’s growth in the future”. Xtrac are excited to work with such a prestigious initiative and look forward to continuing their support of the Motorsport Industry.